One of the reasons that traders use charts is to help them pick the right price points or points of interest for their investment objectives. We want these points of interest to be more than fleeting feelings wonder. Now you can easily set alerts at any point by clicking on Chart and choosing the alert bell. Once activated, these alerts are stored on our servers so we will let you know when the condition is met, regardless if you are logged on or not. Activate Chart Trading at the top of your chart. 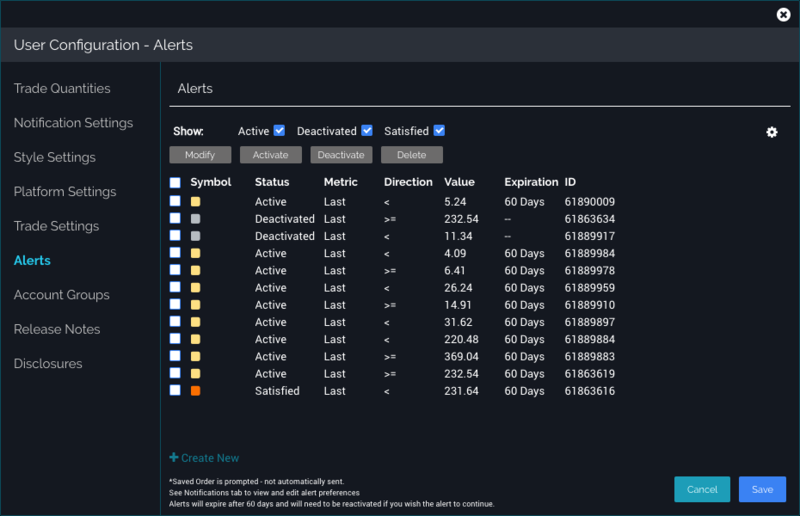 Creating an alert follows similar logic to placing orders: Picking a price below the current market will default the alert to the "less than" direction, and picking a price above will default the direction to "greater or equal to." Clicking "activate" will send the alert to our servers and you will be notified. We have expanded the ability to search news out a bit further. Now you can filter out the news to see the stories that are relevant to your positions. 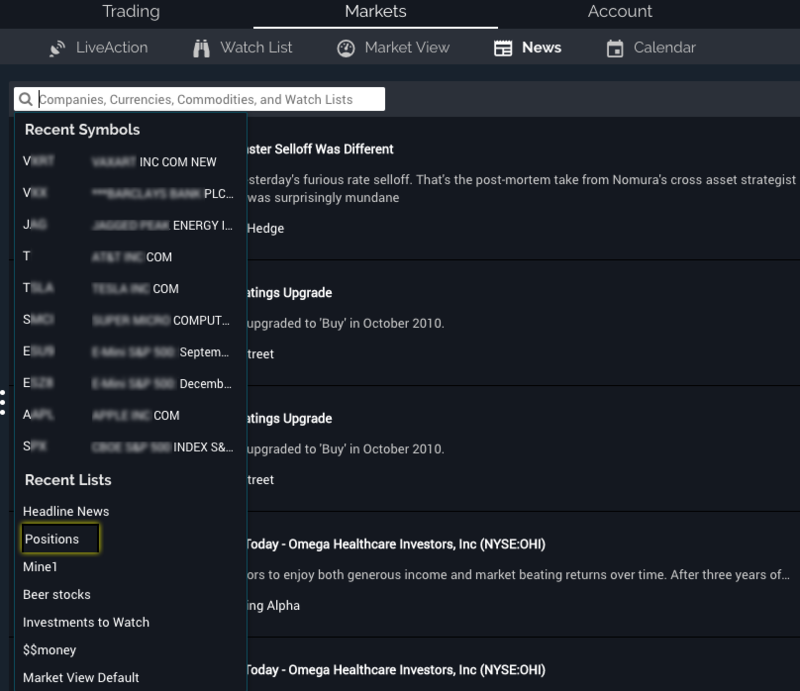 This will allow you to browse news that is focused solely on your portfolio. You can also now type in the name of any Watch List you have created to search for the list by name. The news filter is shown on the top of your News page under the Markets tab. Clicking on the data entry box will display the most recent symbols, lists, as well as positions and headline news. The more data points, the merrier. It’s an old saying that we like to use to pressure our data providers, and once in a while, our persistent pestering pays off. Our hope is that you notice a consistent theme going forward as you will continue to see new helpful data points available. First up is Delta from 52 week high and Delta from 52 week low. 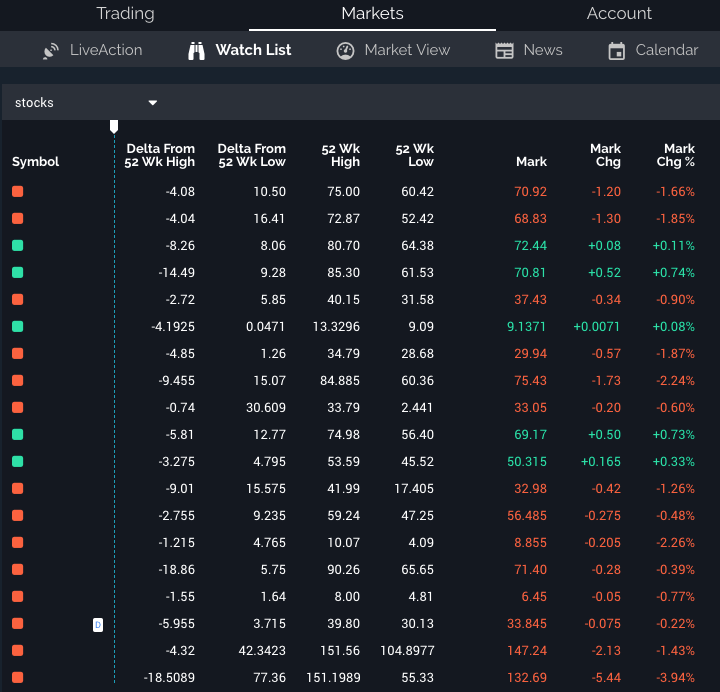 As with all of your Watch List columns, these columns are added and removed from the gear at the top right-hand corner of your Watch List page under the Markets tab. From the gear menu, click "Select Columns". You will see the new columns titled "Delta From 52 Wk High" and "Delta From 52 Wk Low"
Charting leads to charting, which often leads to an investigation of how many different studies coincide. Now your charts allow you to see more useful information about your studies so that you can determine any particular study’s settings. As soon as you hover your mouse over any of the study lines, you will be a descriptive tooltip to help focus the precision of your charting.